« As China lands on the Moon, is a GLXP team next? 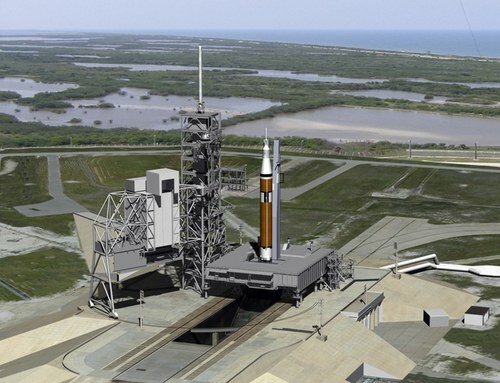 When NASA announced plans earlier this year to lease Kennedy Space Center’s Launch Complex 39A (LC-39A), a pad used for Space Shuttle launches but no longer needed by NASA, it probably didn’t anticipate the legal battle that resulted. Only two companies, Blue Origin and SpaceX, submitted proposals to lease the pad, but a dispute over whether the pad should be a multi-vehicle facility or exclusively used by one company delayed a decision on who should get access to the pad. The logjam broke Thursday afternoon when the Government Accountability Office (GAO) released its decision on a bid protest filed in September by Blue Origin. The company claimed that NASA would not equally treat proposals submitted that would make LC-39A a multi-vehicle facility, versus one exclusively used by one company. (Blue Origin had submitted such a proposal, while SpaceX had originally submitted plans to make exclusive use of the pad.) Included in Blue Origin’s complaint was a comment by NASA administrator Charles Bolden earlier in the year, who said neighboring LC-39B was the preferred site of a multi-user launch pad (including for NASA’s own Space Launch System). The GAO, in its decision, concluded that it did have jurisdiction to consider the dispute, something NASA had not agreed was the case. However, the GAO found no evidence that NASA favored one type of lease proposal over the other. “In the final analysis, we agree with the agency that the AFP contemplates two possible approaches, but includes no preference for one approach versus another,” the GAO concluded, denying Blue Origin’s protest. When the GAO released its decision, NASA didn’t indicate when it would make a decision about the lease of LC-39A. It did not, though, end up wasting any time: on Friday afternoon, NASA announced it was entering into negotiations with SpaceX for leasing the pad. “NASA made the selection decision Thursday after the U.S. Government Accountability Office (GAO) denied a protest filed against the Agency by Blue Origin LLC on Sept. 13,” NASA stated in the release. The agency explained that it continued to evaluate the proposals while awaiting the GAO decision, and thus was ready to move as soon as the protest was formally denied. And, as it turns out, the debate over whether LC-39A should be an exclusive-use or multi-use pad turns out to be a moot one. When the controversy over the pad erupted in September, with dueling letters from members of Congress supporting both Blue Origin’s and SpaceX’s bids, SpaceX announced it was open to allowing other companies to use the pad if they wanted. “At the time we submitted the bid, SpaceX was unaware any other parties had interest in using the pad,” the company said then. “However, if awarded this limited duration lease on 39A, SpaceX would be more than happy to support other commercial space pioneers at the pad, and allow NASA to make use of the pad if need be.” Blue Origin has indicated recently they would not be ready to begin test flights of their orbital vehicle until 2018, so SpaceX might not have much company at LC-39A for a while.